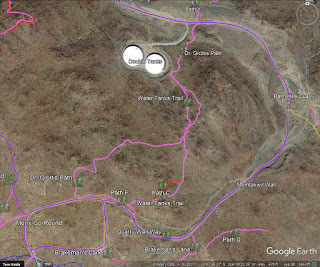 The Goat Trails is a network of doubletrack roads and informal singletrack trails that are in the low hills above the south part of Palm Springs CA. The Goat Trails have also been called the Rimrock Trail and the Von's Trail. The Goat Trails receive use that varies with the season. As many as 300 users per day can be seen from October to April, from sunrise to sunset. About 50 users per day take to the trail in the morning and late evening from late Spring through October. The Goat Trails are on private property. The initial doubletrack ascent and an iron gate are owned by John Wessman, as represented by his acquisition/management firms GRIT Development, Wessman Development Company and Wessman Holdings. A small parcel of 3.92 acres is owned by Desert Water Agency to locate two large water storage tanks. 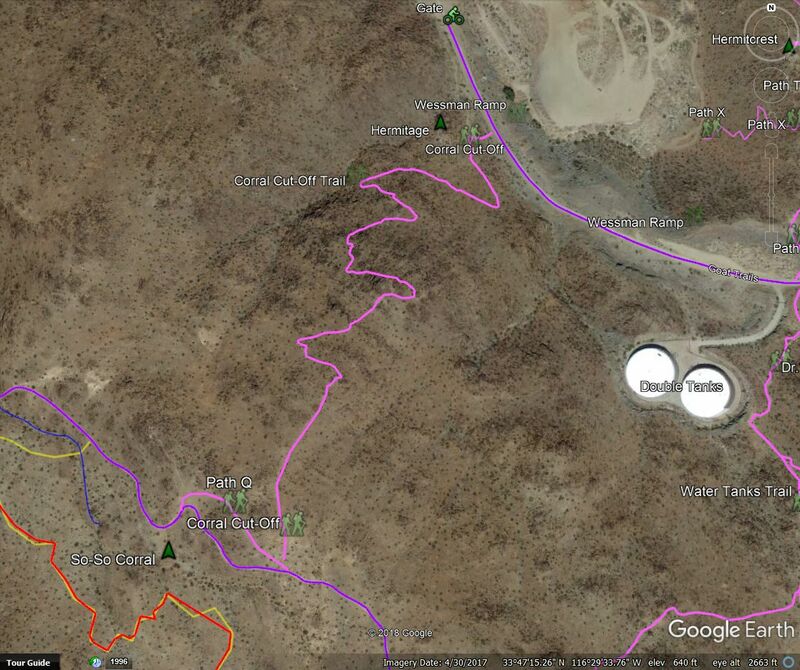 The upper portions of the Goat Trails are owned solely by Palm Hills Land Corporation, a large landowner in undeveloped portions of the Santa Rosa and San Jacinto National Monument. Less than one quarter mile of trails edge into property owned by U.S. Department of the Interior, which has the parcel (APN) 681-160-018. The iron gate maintained (perhaps) by Wessman Development Company contains several indications that the property is private, including a painted-over sign that directs inquiries to the Palm Springs Police Department. Calls to the listed number did not reach a person with knowledge of the property and any restrictions to its use. The gate is usually secured with a heavy chain to which several padlocks are attached. At least one padlock is controlled by the Palm Springs Fire Department, another is controlled by Desert Water Agency. Presumably, other padlocks are controlled by the Palm Springs Police Department, Wessman Development Company, and an agent of Palm Hills Land Corporation. Highway 111 crosses the top of the image. The iron gate is marked with a green cyclist avatar and the doubletrack is outlined in a magenta curve at the botrom of the image. The trail (Path T) to Hermit Crest is outlined as a magenta curve from near the top center of the image to double back on itself as it climbs to Hermit Crest. A secondary trail (Path Y) continues to meet the doubletrack up from the iron gate. 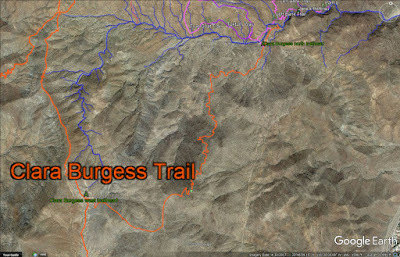 Accesses are also available from official trails nearby: Araby Trail at the northwest corner of the Goat Trails, Garstin Trail to Berns Trail at the northwest corner of the Goat Trails, Wildhorse Trail to the southwest corner of the Goat Trails, Clara Burgess Trail to a couple points on the south side of the Goat Trails, and Eagle Canyon Trail to the east side of the Goat Trails. The iron gate is usually padlocked, and near-annual grading activities include placing large rocks and dirt piles outside the gate to thwart access. However, the padlocks are often cut off, and the many hiking and biking users wear a trail that bypasses the dirt piles soon after they have been placed. A second access from the area of Highway 111 is via a separated hill, unofficially named "Hermit Crest." A poorly maintained doubletrack climbs the hill, starting from the northwest in a clockwise semicircle. As it reaches six o'clock in its circle, the doubletrack breaks apart and doubles back to the right, still heading up. Shortly thereafter is a trail to the left that will join the ramp up from the iron gate. The end and highest point of Araby Trail (orange line) connects to the Goat Trails (magenta). Limited parking is available on Rim Road, near the lower trailhead. 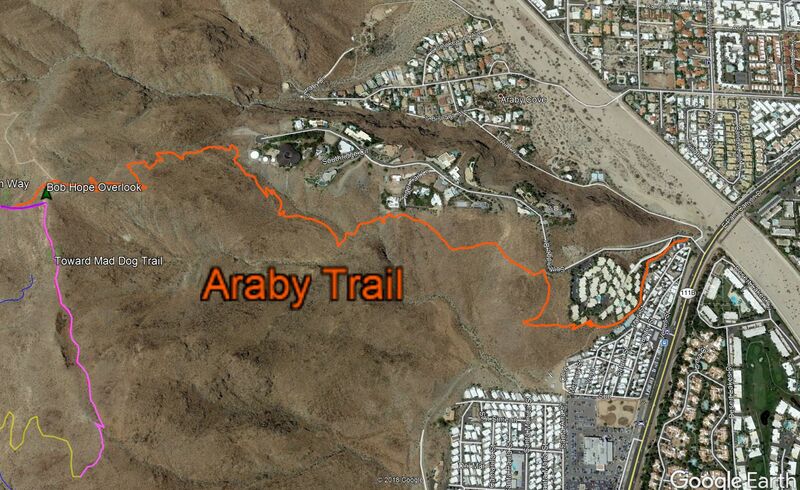 The distance on Araby Trail is 1.78 mi. The ascent from 415 feet to 1347 feet is difficult for mountain bikes, but possible. The descent is "black diamond," but enjoyably challenging. Dogs are not allowed, not even on leash. Several cutoffs exist, and the Desert Riders attempt to keep these from growing—please avoid following cutoffs. 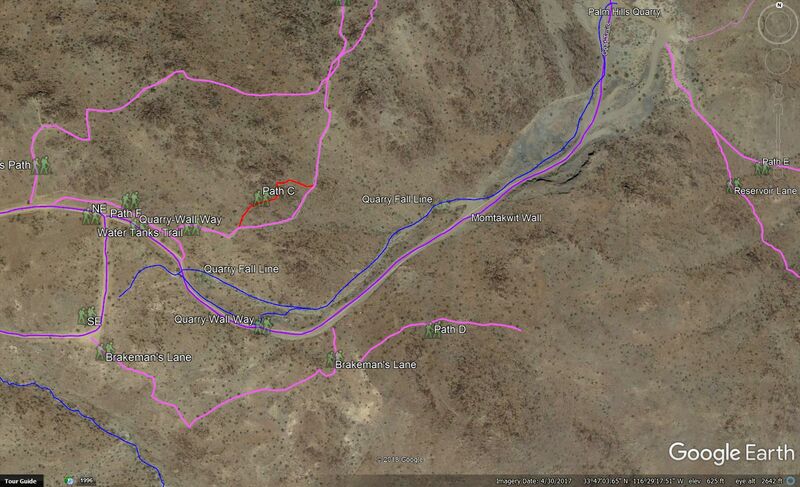 The end of Berns Trail (orange line) connects to the Goat Trails (magenta). 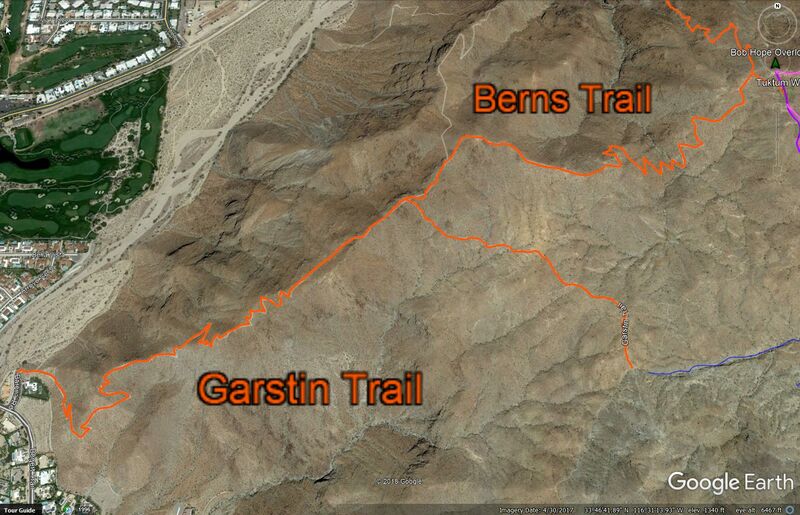 Berns Trail can be reached by climbing Garstin Trail (orange line) or Shannon Trail from the north (not highlighted). Limited parking is available on Barona Road, near the lower Garstin trailhead. The distance on Garstin Trail is 1.19 mi. The distance of Berns Trail is 1.04 mi. The Garstin ascent starts at 543 feet to the turnoff to Berns at 1424 feet, and Berns ascends to 1513 feet (a large cairn), descends to a wash at 1151 feet, and climbs to meet Araby Trail and the Goat Trails at 1322 feet. The ascent is difficult for mountain bikes, but possible. The descent is "black diamond," but enjoyably challenging. Dogs are not allowed, not even on leash, due to conservation of Peninsular Bighorn Sheep. Several cutoffs exist, and the Desert Riders attempt to keep these from growing—please avoid following cutoffs. Bogert Trail (middle orange line) leads up to the area of the Goat Trails, although its upper trailhead is about a half mile short of the Goats. Bogert Trail is 1.76 mi long. Its lower (west) trailhead is at 772 feet, which rises to 922 feet in the first quarter mile. From this point, the trail descends to 815 feet in the second quarter mile, then rises to 1298 feet over the next half mile, where it meets the junction of Garstin (top orange line) and Wildhorse (center-to-bottom orange line) trails. Heading east from the junction, Bogert rises to 1307 feet where it connects to a minor trail of the Goat Trails (magenta lines). The ascent is moderate for mountain bikes, and the descent is intermediate difficulty, with a few challenging aspects. Dogs are not allowed, not even on leash, due to conservation of Peninsular Bighorn Sheep. The Desert Riders maintain this trail—please avoid following cutoffs. 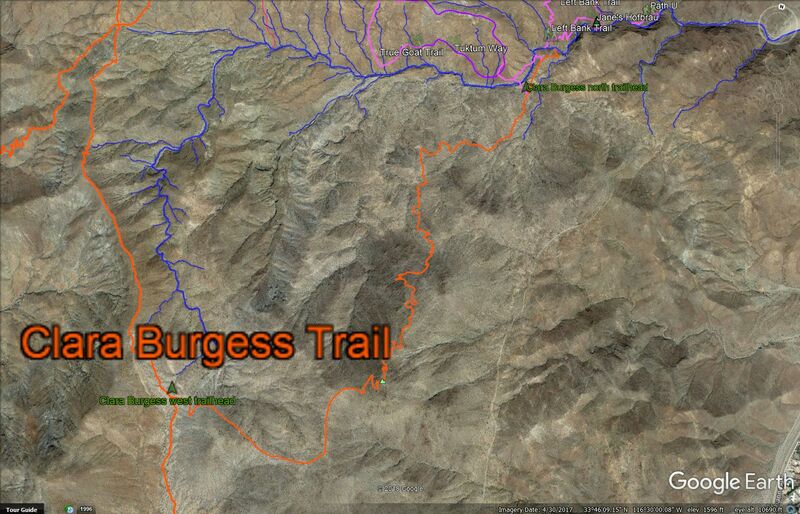 Clara Burgess Trail (orange line) descends north to its trailhead from Murray hill (mountain symbol). 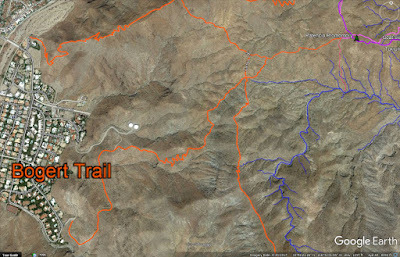 From the trailhead sign, descend into Eagle Canyon, and ascend on the north bank to the Goat Trails. From the west, Clara Burgess separates from Wildhorse Trail at 1780 feet and ascends to 2192 feet over 0.73 mi to the tops of Murray Hill. From Murray hill, Clara Burgess descends to 876 feet over 1.56 mi. For bikes, the west ascent is moderate; the north ascent is difficult but doable. The descents are "black diamond." Bob Hope Overlook—the northwestern corner of the Goat Trails, where the Berns Trail and Araby Trail access the Goat Trails. Most hikers experience only this first third of the Goat Trails, which constiutes the entrance trails. 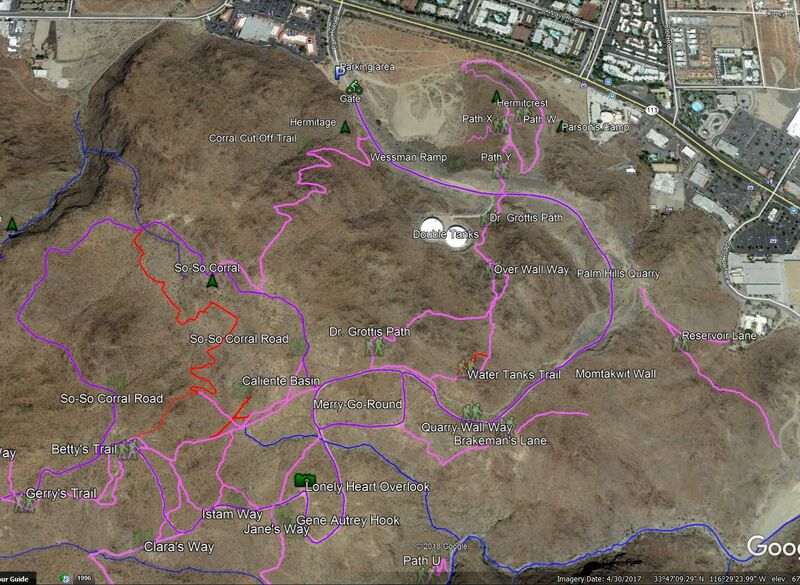 The aggressive climbs on the entrance trails are, arguably, the more difficult part of the Goat Trails. This .28-mile doubletrack trail rises from the parking area to beyond the access to the water tanks. This private property is owned by Wessman Development Company, and Desert Water Agency has an easement for its use to maintain the Double Tanks. This steep singletrack west of Wessman Ramp starts within 100 yards of the iron gate. 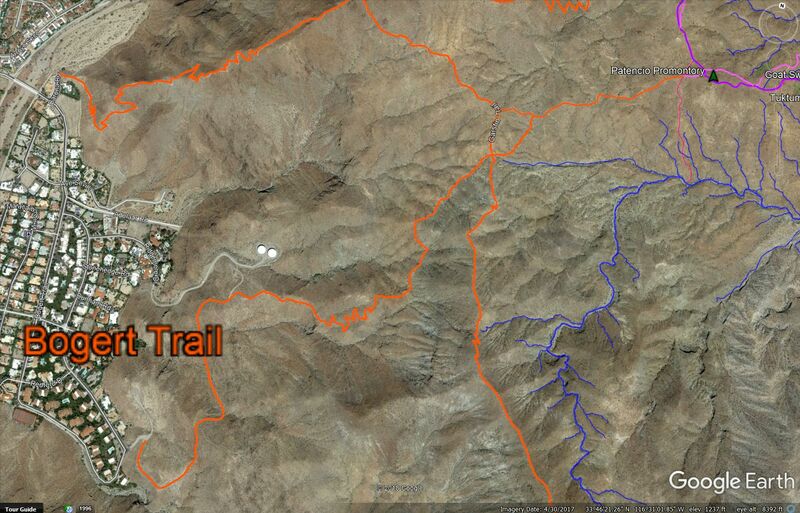 The trail passes the Hermitage and reaches So-So Corral Road after about 0.58 mile of climbing. Desert Water Agency owns and maintains this pair of water reservoirs. Trespassing is absolutely forbidden, and its property is video monitored and secured by a padlocked gate. Dr. Grottis Path affords an overlook of the tanks. The lower trailhead of Dr. Grottis Path is on the right, just beyond the Double Tanks road. The ascent is challenging for mountain bikes, and it is a popular alternative to the longer doubletrack through Palm Hills Quarry. 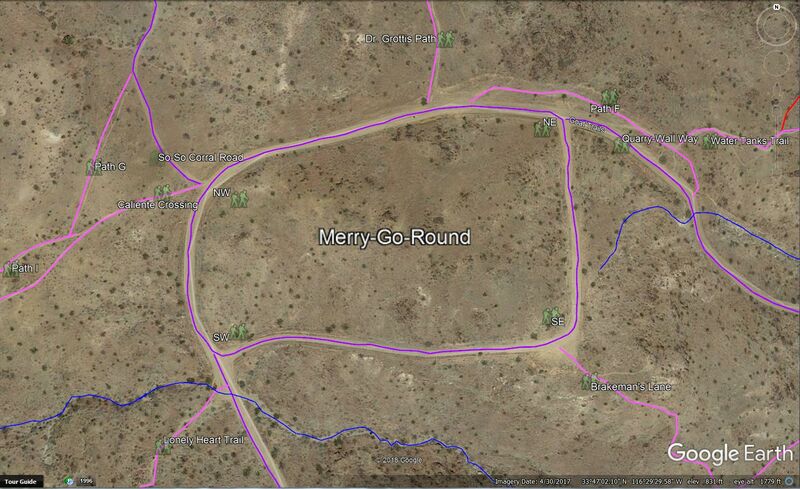 The upper trailhead of Dr. Grottis Path is at the north side of the Merry-Go-Round. An alternative path, Water Tanks Trail, separates from Dr. Grottis Path above the water tanks. 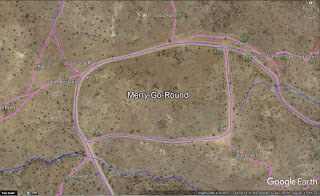 The Water Tanks Trail has an upper trailhead near the northeast corner of the Merry-Go-Round. Palm Hills Quarry was active while the primary landowner, Palm Hills Land Corp, pursued rogue plans for building roads outlined in their planned housing development. Although PHLC mapped a development of some 75 lots and connecting streets, the addition was never approved by Palm Springs. The quarry still has piles of sand, gravel, and rock as well as roughly-graded portions of the planned streets. During the rainy season, some portions of the quarry are filled with accumulating run-off from the higher trail and hills. Several short trails head off to the north and east from Palm Hills Quarry. 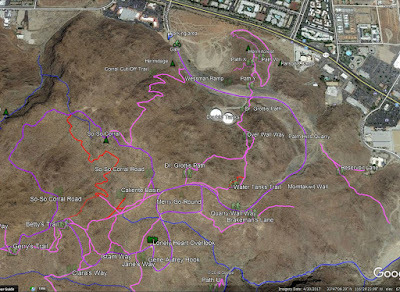 Only two of these are of note: Path E leads down to Canyon Plaza, and Reservoir Lane leads to the dam at the mouth of Eagle Canyon (0.22 mi). This 0.59-mile doubletrack trail continues from Wessman Ramp into Palm Hills Quarry (473 feet above sea level) and then up three distinct, steep sections separated by small reliefs. It finishes at the northeast corner of the Merry-Go-Round, at 797 feet. Several small trails depart from the third climb. Momtakwit Wall is a small cliff that rises above Quarry-Wall Way as it leaves Palm Hills Quarry at its south end. Momtakwit was the first leader of the Cahuilla. Opposite Momtakwit Wall is a primary fall line (the shortest line downhill, which is often the location for most water erosion) that threatens Quarry-Wall Way seasonally. The landowner has never successfully built a bypass of this fall line, and winter storms often take out the doubletrack to become as small as a singletrack trail. Cue the training in building sustainable trails! The lower trailhead for the short Brakeman's Lane has been obscured by recent heavy equipment work on Quarry-Wall Way. The trailhead will be reinstalled once the grading work is complete. Wooden stakes at the top of Momtakwit Wall locate the trailhead in the meantime. Brakeman's Lane has relatively few users, and its upper trailhead is at the southeast corner of the Merry-Go-Round. Its northwest corner to Caliente Crossing and So-So Corral Road. This trail is more extreme than a pump track, with nice downhills followed by tough climbs, whether you ride clockwise or counter. This quarter-mile doubletrack continues from the southwest corner of the Merry-Go-Round up to the Lonely Heart Overlook. When seen from Lonely Heart Outlook, the hook seems to be a continuation of Gene Autry Trail in Palm Springs. This .83-mile, long-unmaintained half circle of doubletrack circles the Caliente Basin. The trail offers superb downhill clockwise and some extreme climbing counter-clockwise. This .85-mile doubletrack leaves Lonely Heart Overlook and heads to the Stone Man Monument. Several singletrack trails head off along its length. Reference: Palm Springs council mention "Palm Hills"
No issues are "Significant and unavoidable" (the worst case); 24 issues are "potentially significant." These require a variety of mitigations. Another 42 issues are "less than significant," for which no mitigation is required. The linked posts list only the 24 issues that require mitigation. * No "potentially significant" impacts found. The study has five levels of environmental impacts. Those impacts that may create a significant adverse change in the environment. Those impacts that may create a significant adverse change in the environment, but whose changes can be managed by certain mitigation measures. Those impacts that can be reduced to an acceptable or insignificant level through mitigation measures. Those conditions that do not impact the environment. I cop to not certainly understanding what the study means by the definition: "There are no known areas of controversy in the project’s physical characteristics that are not resolved by project design, development management and operation, mitigation measures or standard on-going monitoring." I believe the intent is to say that the project's designers have considered all possible controversy and incorporated responses as the design developed. Wikipedia defines mitigation thoroughly. Environmental mitigation is a debit-credit system that balances destruction or impairment of a natural resource with actions or features that improve or preserve a natural resource. When a business or project has a "debit," it is required to purchase or provide a "credit." Crediting systems can generate credits in different ways. Mitigation is a more development-friendly alternative to strict environmental laws because it allows development to occur where environmental laws might prohibit it. CV Link is a 50-mile non-motorized, multi-modal transportation path that passes through the developed and populated portions of the Coachella Valley. CV Link provides access and connectivity between residential, commercial, recreational, institutional, and other land uses throughout the region and provides simultaneously recreational opportunities for pathway users. The Link reduces local traffic volumes on roadways, lowers overall air pollution, increases safety for non-motorized vehicles, and builds a sense of community among all parts of the Coachella Valley. In longterm view, CV Link affords connection to other alternative transportation in Southern California, including existing networks in the Cities of Riverside and Redlands and the Santa Ana River Corridor and potential networks in the High Desert Cities and along the Palms to Pines Highway. CV Link could violate water quality standards or waste water discharge requirements. The project will comply with the requirements of the National Pollution Discharge Elimination System (NPDES). As applicable, CV Link construction will follow the CVWD and RCFCWCD standards and guidelines, including to the Riverside County Whitewater River Region Stormwater Quality Best Management Practice (BMP) Design Handbook for Low Impact Development (RCFCWCD, 2014) and the CVWD Development Design Manual (CVWD, 2013). The implementation of BMPs during construction activities will limit erosion and siltation from earthmoving and other construction activities. Exposed soil from excavated areas, stockpiles, and other areas where ground cover is removed will be stabilized to avoid or minimize the inadvertent transport by wind or water. The project is subject to NPDES Construction General Permit requirements. A Stormwater Pollution Prevention Plan (SWPPP) will ensure that erosion, siltation and runoff do not result in flooding on or off the project sites. The SWPPP will identify specific best management practices to ensure that the project meets the requirements of the California State Water Resources Control Board (SWRCB) NPDES Construction General Permit and the Caltrans NPDES Permit. The BMPs will include a) Construction-related erosion and sediment controls, stabilization practices or structural controls, silt fences, earth dikes, drainage swales, sediment traps, check dams, reinforced soil retaining systems, temporary or permanent sediment basins and flow diversion. Temporary erosion and sediment control measures shall be installed during or immediately after initial disturbance of the soil, maintained throughout construction (on a daily basis), and reinstalled until replaced by permanent erosion control structures or restoration of the construction right-of-way. In addition, the following specific actions shall be taken to ensure that impacts are less than significant. a. CV Link construction shall be avoided within the limits of identified waterways as depicted on the Jurisdictional Delineation Report prepared for this DEIR, except where authorized by federal, state or local permits. b. Protect inlets and outlets of culverts from construction material intrusions using temporary berms to prevent channel incision, erosion, and sedimentation. c. Erosion control measures appropriate for on-the-ground conditions, including percent slope, length of slope, and soil type and erosive factor, shall be implemented. d. Temporary erosion controls such as straw bales and tubes, geotextiles and other appropriate diversion and impounding materials and facilities shall be properly maintained throughout construction (on a daily basis) and reinstalled (such as after backfilling) until replaced with permanent erosion controls or restoration is complete. e. Where jurisdictional waters are adjacent to the construction right-of-way, the contractor shall install sediment barriers along the edge of the construction right-of-way to contain spoil and sediment within the construction right-of-way. f. Ensure that all employees and contractors are properly informed and trained on how to properly install and maintain erosion control BMPs. Contractors shall require all employees and contractors responsible for supervising the installation and maintenance of BMPs and those responsible for the actual installation and maintenance to receive training in proper installation and maintenance techniques. g. Project scheduling will include efficient staging of CV Link construction that minimizes the extent of disturbed and destabilized work area, and reduces the amount of soil exposed and the duration of its exposure to wind, rain, and vehicle tracking. h. The use of a schedule or flow chart will be incorporated to lay out the construction plan and will allow Link construction to proceed in a manner that keep water quality control measures synchronized with site disturbance, paving and other construction activities. i. The sequencing and time frame for the initiation and completion of tasks, such as site clearing, grading, excavation, path construction, and reclamation, shall be planned in advance to ensure minimization of potential impacts. j. Erosion and sediment control BMPs shall be incorporated into travelway construction plans. a. Construction equipment and vehicles shall be properly maintained to prevent leakage of petroleum products. b. Herbicides, fertilizers, vehicle maintenance fluids, petroleum products shall be stored, and/or changed in staging areas established at least 100 feet from delineated streams and other drainages. These products must be discarded at disposal sites in accordance with state and federal laws, rules, and regulations. c. Drip pans and tarps or other containment systems shall be used when changing oil or other vehicle/equipment fluids. d. Areas where discharge material, overburden, fuel, and equipment are stored shall be designed and established at least 100 vegetated (permeable) feet from the edge of delineated streams. e. Any contaminated soils or materials will be disposed of off-site in proper receptacles at an approved disposal facility. f. All erosion control measures shall be inspected and repaired after each rainfall event that results in overland runoff. The project contractor and CVAG shall be prepared year round to deploy and maintain erosion control BMPs associated with CV Link. g. Existing culverts shall be carefully maintained in place in order to ensure that they function properly. Considerations include: maintenance of inlet and outlet elevations, grade, adequate compacted material cover, and inlet/outlet protection. Restoration involves restoring the right-of-way to pre-construction conditions by final grading, installation of permanent erosion control measures such as slope breaks and retaining walls at appropriate distances to prevent rill (channel) formation between slope breaks, and re-establishing vegetation where it has been removed to facilitate construction. a. Cleanup operations shall commence immediately following backfill operations on slopes approaching delineated streams and other drainages. b. Final grading to restore pre-construction contours shall be completed and soil left in pre-existing condition within 7 days after backfilling the trench. c. Restoration crew shall follow construction crews as they work systematically from one end to the other end of each Link alignment. If crews cannot work systematically from one end to the other, then erosion control BMPs shall be maintained on all slopes approaching a delineated stream and adjacent to these sensitive areas. If seasonal or other weather related conditions prevent compliance with these time frames, erosion control BMPs shall be maintained until conditions allow completion of cleanup. CV Link will create or contribute runoff water, which would exceed the capacity of existing or planned stormwater drainage systems or provide substantial additional sources of polluted runoff. The implementation of BMPs during construction activities shall ensure that erosion and siltation from earthmoving and other construction activities is limited. Exposed soil from excavated areas, stockpiles, and other areas where ground cover is removed shall be stabilized by wetting or other approved means to avoid or minimize the inadvertent transport by wind or water. The project is subject to NPDES Construction General Permit requirements. Project implementation of a Stormwater Pollution Prevention Plan shall be required to ensure that erosion, siltation and runoff do not result in flooding on or off the project sites, and that impacts are less than significant. A Stormwater Pollution Prevention Plan (SWPPP) shall be prepared and implemented during construction of the Proposed Project. The SWPPP shall identify specific best management practices (BMPs) that will be implemented during project construction. BMPs implemented as a part of the project will ensure that the project meets the requirements of the California State Water Resources Control Board (SWRCB) NPDES Construction General Permit and the Caltrans NPDES Permit. BMPs appropriate for and applicable to the CV Link project include the following. Construction-related erosion and sediment controls, including any necessary stabilization practices or structural controls, shall be implemented at and in all potentially affected drainages. General structural practices may include, but are not limited to, silt fences, earth dikes, drainage swales, sediment traps, check dams, reinforced soil retaining systems, temporary or permanent sediment basins and flow diversion. Temporary erosion and sediment control measures shall be installed during or immediately after initial disturbance of the soil, maintained throughout construction (on a daily basis), and reinstalled until replaced by permanent erosion control structures or restoration of the construction right-of-way is complete. In addition, the following specific actions shall be taken to ensure that impacts are less than significant. flow. CV Link construction will follow the CVWD and RCFCWCD design and development standards and guidelines, including limited to the Riverside County Whitewater River Region Stormwater Quality Best Management Practice Design Handbook for Low Impact Development (RCFCWCD, 2014) and the CVWD Development Design Manual (CVWD, 2013). CV Link could expose people to a risk of loss, injury or death involving flooding, including flooding as a result of the failure of a levee or dam. CV Link construction will follow the CVWD and RCFCWCD design and development standards and guidelines, including limited to the Riverside County Whitewater River Region Stormwater Quality Best Management Practice Design Handbook for Low Impact Development (RCFCWCD, 2014) and the CVWD Development Design Manual (CVWD, 2013). shall be approved by the USFWS. 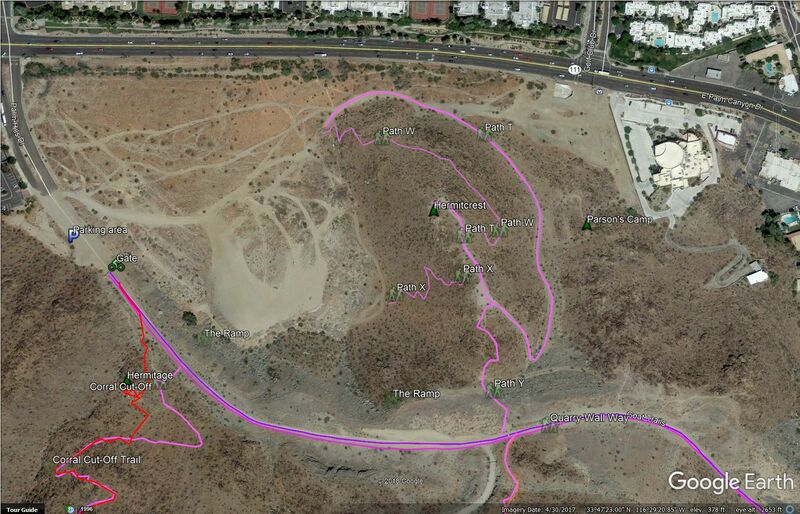 habitat suitable for CJB as identified on Exhibit 4.4-1.
restoration area of Tahquitz Creek Golf course, as described in item 1.
maintenance of the path within the Survey Area. about the species and the importance of native desert wash habitat. habitat and to encourage respect for and avoidance of undisturbed habitat areas. must occur in accordance with the EPA label on each product. user or impacting adjacent habitat. h. No electronic “bug zappers” will be utilized. restored or conserved by CVAG. agency/organization approved by the Service. or fill material into waters of the US. under Section 401 of the CWA. impact and the properties of the waterway. Agreement shall be approved and issued by the California Department of Fish and Wildlife. September 1st and January 31th, no pre-removal nesting bird survey is required. burrowing owls shall be provided a 500-foot buffer. Project Review process to determine consistency with plan goals and objectives. 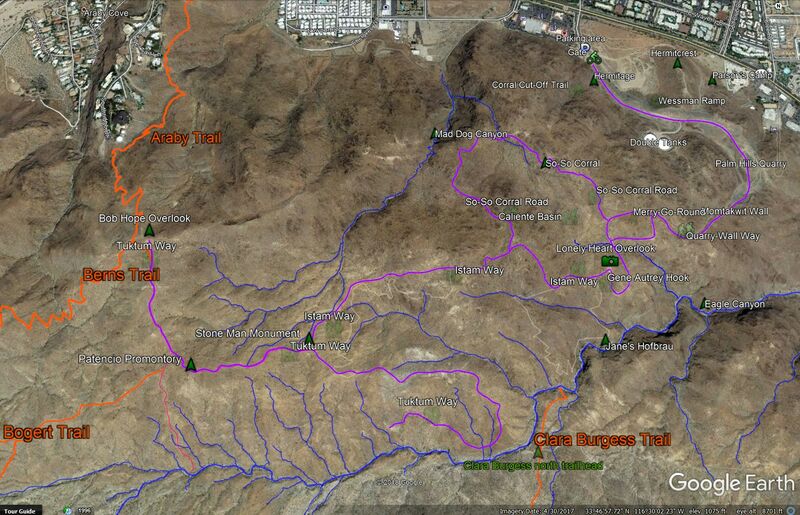 Whitewater Floodplain and Santa Rosa and San Jacinto Mountains Conservation Areas. within the adjacent conservation area. shielded and directed away from the conservation area, toward developed areas. ornamental plant species are listed in Table 4-113 of the CVMSHCP (Appendix E). be incorporated into landscape design within or adjacent to conservation areas. limited to a final survey conducted within 24 hours prior to ground disturbance." users). In addition, disposal bins for pet waste shall also be provided throughout CV Link. the native wildlife, plant, or vegetation communities present adjacent to CV Link. Using track-out reduction measures such as gravel pads at project access points to minimize dust and mud deposits on roads affected by construction traffic. A year after the CV Link concept was revealed, CVAG has released the environmental study for the project. The study's title has a bit of heft: Draft Environmental Impact Report (SCH No. 2013111050) for the CV Link Multi-Modal Transportation Project. The main document has a bit of heft too, almost 700 pages, and an additional 17 appendices with another 4000 or so pages. The environmental study also goes by the easier acronym, DEIR. The study describes the possible impacts to the environment that building CV Link may cause, and it offers ways to limit the impacts. Similarly, the study describes impacts of operating CV Link. This blog post and others that share the title CV Link and the Environment provide a summary of the DEIR. CV Link is a multi-jurisdictional project. The route analyzed in this DEIR extends across 12 jurisdictions, including eight incorporated cities, unincorporated county lands, and three Native American tribes. Because two cities of the Coachella Valley held referenda that relate to parts of CV Link, the DEIR considers the impacts of three alternatives to the development of CV Link. This alternative analyzes the environmental consequences of building CV Link without the participation of the cities of Rancho Mirage and Indian Wells. Under Alternative 1, the CV Link segments generally extending eastward from Frank Sinatra Drive and along the stormwater channel and public streets to Monterey Avenue are not included. Neither are those street and channel alignments in Indian Wells and generally extending from Fred Waring Drive on the west to Washington Street on the east. With the deletion of CV Link segments through Rancho Mirage and Indian Wells, Alternative 1 requires the selection of logical termini at Indian Wells, as they have been selected for Rancho Mirage, in the vicinity of respective city limits . This alternative analyzes the environmental consequences of building CV Link through all of the incorporated cities, unincorporated county, and Native American lands from Pam Springs to Coachella. It evaluates all of the prospective route alignments, including those that pass through the cities of Indian Wells and Rancho Mirage. This alternative, therefore, evaluates all of the alignment variations for the complete 50-mile long route. The western terminus is at Highway 111 (North Palm Canyon Drive) in northern Palm Springs at or near the Palm Springs Visitor Center at Tramway Road. The eastern terminus is at Airport Boulevard (Avenue 56) and the Coachella Valley Stormwater Channel (CVSC) to the south of the City of Coachella and north of the unincorporated community of Thermal. This alternative analyzes the environmental consequences of not building CV Link, and relying instead on the existing but limited multi-modal of paths and street markings that form a roughly equivalent network in the vicinity of the CV Link route. Any future facilities set forth and described in the various jurisdiction general plans or transportation plans will continue to expand both intra-city and inter-city multi-modal networks. The pathway largely follows the region’s principal watercourses, including Chino Wash, Tahquitz Creek, Whitewater River Stormwater Channel (WWR), and the Coachella Valley Stormwater Channel (CVSC). Where possible, CV Link will be constructed on top of flood control levees and service roads, and at the top of stormwater channel slopes of the WWR and the CVSC. In areas where these major drainage corridors are inaccessible, on-street routes are proposed. Grade-separated crossings (bridges or under-crossings) of major roadways are proposed. Alignment variations using the street network are also analyzed and provide options for near and long-term implementation. In some locations, the pathway shares right-of-way with roads and provides direct access to key commercial districts and recreational and institutional venues. CV Link will also incorporate and expand the Tahquitz Creek Trail in Palm Springs between South Palm Canyon Drive and the Whitewater Channel. The western terminus is at South Palm Canyon Drive in central Palm Springs, which provides access to adjacent commercial services and to downtown Palm Springs, as well as the Tahquitz Canyon Visitor Center. The eastern terminus is at the WWR near the west end of the Dinah Shore Bridge. The planned CV Link includes several access points in each city that will connect to city bikeways or park-like walking and biking areas. However, these city-specific pathways are not in the scope of CV Link construction. "Are you in favor of La Quinta being part of the CV Link? Why or why not?" Linda Evans, winner 2016 with 83%: "I support La Quinta being part of the CV Link. It provides a safe route for cyclists, runners, and walkers. It offers the option to take cars off the roads, resulting in less environmental impact. It provides a safe, free passage for a healthy lifestyle, like our other hiking/biking trails and parks. It connects our valley as an alternative transportation option, allowing access to shopping, dining, schools, and other amenities. The two-mile plus stretch in La Quinta will be one of the least impactful sections; the route is visible and non-intrusive to private areas. The maintenance costs will likely be similar or less than the City’s current spend on Bear Creek Trail and Cove hiking trails. Many states across the country have similar paths that are used for transportation, recreation, and tourism. I invite people to walk LQ’s section with me and experience its potential for our city and valley. " I endorse this wholehearted support of CV Link and the safe corridor it will provide for all types of alternative transportation. Evans' insight that CV Link has benefits similar to a park shows her flexibility and foresight. Paula Maietta, not winner 2016: "Based upon the information we have, no, I am not in favor of this project. When do these ridiculous Council decisions end? Construction cost is estimated at $100 million, and CVAG does not know where all that money is coming from. I believe that this project will provide greatest benefit to Goldenvoice/AEG and their concertgoers. Let’s privatize this project and contract it out to them, like the toll roads. This should be a decision made by the voters who will be paying maintenance costs for this boondoggle, as we are for Silverrock. There’s discussion that the additional money needed for this project might come from TOT taxes; here we go again. Our TOT taxes will go to this project instead of into our general fund to pay our bills, so the City will propose a TOT tax increase to make up for that loss. And on and on it goes." Maietta reveals an insular and provincial attitude as well as the fact she hasn't become informed about the project. Likely she has heard and bought into the Hobart Boondoggle and its misleading arguments against CV Link. Kathleen Fitzpatrick, winner 2016 with 24%: "I think the CV Link would be great for La Quinta. It would be a complement to our brand promoting healthy living. 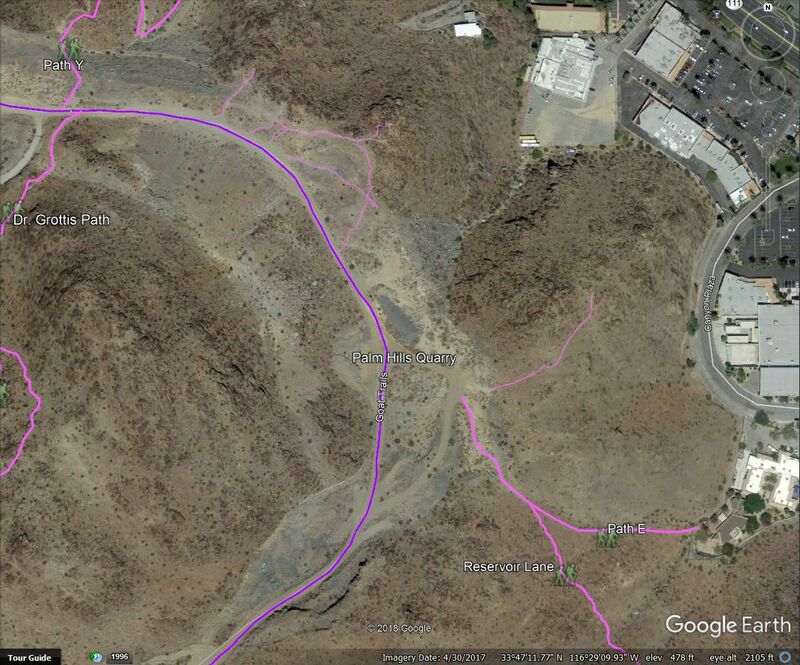 In La Quinta the CV Link would also open up commercial opportunities along the back of the 111 corridor to Link users. However, while we need recreational opportunities that increase our activity and enhance tourism, we need to fully evaluate the costs of maintenance of the trail for the City. In light of our other economic challenges we need to be sure the link can be maintained before we commit to construction." Fitzpatrick seems to be a qualified supporter, and it might help her to read Section 8 of the CV Link Conceptual Master Plan, which offers over 20 sources to combine for funding O&M costs. Kristy Franklin, not winner 2016 with 22%: "I am not going to vote for this project without knowing what it will cost my taxpayers to maintain it. When we spend tax dollars, there will always be some citizens who benefit indirectly, and in the case of CV Link it appears that most of our residents would fall into that category. I’ve been asked by the Cove and Southside citizens why they would want to drive such a distance to ride bikes, walk, run, etc. when La Quinta already has great trails and bike lanes. In addition arteries moving southward from the Link would have to be built and maintained by the City." Franklin has not yet considered cycling and neighborhood electric vehicles as transportation. To her, they are merely another leisure activity, and it seems she believes leisure can be relegated to isolated areas that already exist. Joe Johnson, not winner 2016 with 14%: "The CV Link is not a terrible idea for a bike path. It isn’t suitable for pedestrians, walking dogs on hot concrete, or for electric carts. The proposed section going through La Quinta is troubling. The limited access here makes it almost useless for anything except bike riders. We have a new item, maintenance. This will cost us another $100,000-$250,000 a year, not including the cost of Sheriff patrols (this is just like any other street and needs constant patrol). Due to its desolate environment and 24-hour access, our few miles are just a problem waiting to happen." Johnson has freely expressed his opposition to CV Link elsewhere, and he seems to revel in the half-truths expounded by other opponents. I must correct his statements about the cost of maintenance: The project document (CV Link Conceptual Master Plan, Section 8) lists over 20 sources of funding for O&M costs, which are estimated to be about $10K to 30K per mile annually. These O&M costs include maintenance, safety and security patrols, marketing and events, insurance and risk management, and general management. Victoria Llort, not winner 2016 with 18%: "CV link is an innovative concept that, when realized, would benefit the Coachella Valley as a whole. Due to La Quinta’s 10 year projected $50 million deficit, all financial costs must be considered. 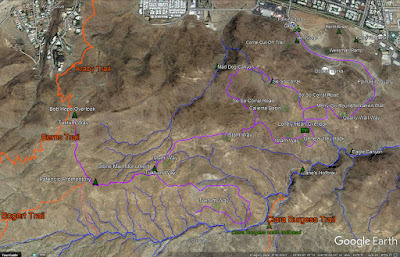 Currently, CVAG (Coachella Valley Association of Governments) is not requesting any funding from participating cities for construction or maintenance of CV Link; foreseeable maintenance expenses are estimated to equal Bear Creek Trail in La Quinta. CV Link would be a great addition that brings potential for La Quinta and tourism enthusiasm." I appreciate Llort's considered, deliberate approach. I believe she would fully support CV Link after she has pored through the CV Link project document. Steve Sanchez, winner 2016 with 22%: "I love waking up at 0400 to run my dogs, workout, or go for a long run; I try to do a half marathon every few months. At first, I was 100% opposed to La Quinta being a part of CV Link; I felt it was a waste of money. But, after learning more about CV Link, how La Quinta’s portion will be funded, I’ve had more of an open mind to it. As a La Quinta City Council member I would never tell another city what they should do, but for La Quinta, I want to see what the EIR report says." Sanchez would be a valuable voice for those who hope to see CV Link come to La Quinta. Of course, there were other questions. See more at the Desert Sun Election Questionnaire.